ALL NEW MINELAB DETECTOR FOR SMALL NUGGETS! 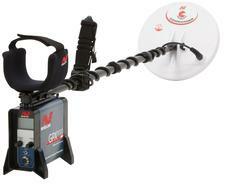 The SDC2300 with the 8" Monoloop coil is the latest in Minelab gold technology. Find elusive sub-gram nuggets on land and underwater! Its compact, rugged design partnered with its waterproof capabilities (10 FEET OR 3 METERS) make it perfect for all-terrain detection. There are two modes of operation: Normal and Salt, which offers users a simple, yet tremendous level of versatility. It is easy to use and features audio and visual target response as well as high-performance MPF technology, which ensures clear, sharp detection of very small gold nuggets. Automatic Ground Balance technology (AGT) comes standard on this machine. Comes complete with UR30 Headphone, Nicad Battery, Instruction Manual, and 3 Year Warranty. The GPX 4500 offers proven field result, offering all of the great features and high performance you have come to expect from a Minelab PI technology detector. If you are looking for super sensitive gold performance at a great price then this is the detector you have been waiting for! The Gold Monster 1000 outperforms all other single frequency VLF gold detectors. The X-Terra 705 Gold Pack uses VFLEX technology with an accurate preset Prospecting Mode, making it the ideal entry level gold detector! The ever popular X-TERRA 705 is now available in an all new Gold Pack configuration. The X-TERRA 705 Gold Pack comes with the 18.75kHz Double-D elliptical coil as standard, to give you effective depth and ground coverage out in the field. Using 18.75kHz as the standard frequency coil, the X-TERRA 705 Gold Pack is especially configured for gold prospecting, with advanced Iron Mask Discrimination and Ground Balance functions, which are perfect for detecting in mineralized goldfield ground.